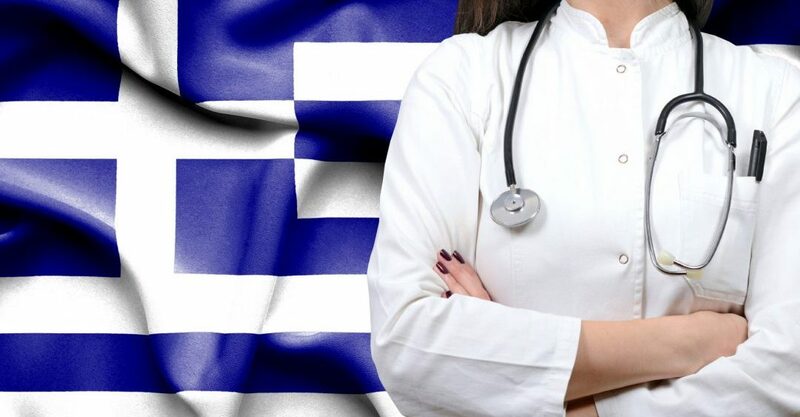 A word of advice to all expats living in Greece – be sure to get comprehensive health insurance. I thought I was covered by my years of contributions to IKA, the Greek national healthcare plan for Brits, but I wasn’t. I hadn’t bothered to take out private health insurance, stupidly believing that nothing bad would happen to me. I was lucky for years, although for most of the time I did have insurance coverage. Of course, as soon as the insurance lapsed, I fell in my flat and damaged my shoulder. I knew I had broken something as the bone in my right arm from my shoulder to my elbow felt like rubber; I couldn’t use my stick. Luckily, my Greek friend was with me and called an ambulance. This arrived after a short while and whisked me off to the nearest hospital. I had X-rays and a scan to check that there were no pieces of bone floating around. There weren’t. There were patients in the corridors with bags of urine and excrement hanging off their bedposts, and these corridors were full. I know that the situation is probably the same in the UK, but still …. The person who took the X-rays – a woman – was efficient, competent and polite. When I saw a junior doctor, eventually, he assumed that I would do whatever he said. He had been busy, as it was around 10 p.m., and was extremely patronising. That made me determined to leave that hospital and my friend, under protest, took me home. For a day or two, I thought that was a mistake. My friend took my X-rays to his ‘bone’ doctor, who recommended a bone specialist, saying that if his mother had a bone injury, this was the doctor he would use. In Greece, there is hardly a better accolade. My friend fixed an appointment and I heard the bad news. I definitely needed an operation as soon as possible. I couldn’t be patched up with a cast. Unfortunately, it would be very expensive, and the estimated cost rose. I decided to try a cheaper hospital, but now wonder why I bothered. I went to two state hospitals with no success. One doctor, who had been recommended to me, checked my X-rays and proceeded to ignore me and spoke only to my friend. The doctor in the second hospital was no better. I investigated the possibility of having an operation in the United Kingdom. I had thought that I could have one on the NHS. Thirty years ago, when I was pregnant, I went to the UK to give birth and was told that I would have to pay, despite being a British citizen. In that situation, I ended up not having to pay. This time, I was not surprised when I realised that I would need to pay for an operation on my shoulder. I would also have needed to pay for a hotel and food as well as being assigned to a waiting list. It would be cheaper to have the operation in Greece. So that’s what I decided to do. In Italy, doctors are looked upon as gods, whereas the young doctors in Greece seem to consider themselves gods. This, of course, goes against the ancient Greek medical tradition when Asclepius and the father of medicine, Hippocrates were practising medicine. I should point out that as I would be paying for treatment, I had expected to be treated with some degree of politeness rather than being met with arrogance. The first doctors in the state hospitals didn’t get my patronage because of their attitudes, so their hospitals lost money. The doctors I saw need customer-relations training. However, the doctor I chose was compassionate and empathetic. I liked him immediately. He reminded me of a family friend. He looked me straight in the eye, which many people fail to do. I decided immediately that I could trust him. I was glad that I was in the position to choose my surgeon. The complex in which my chosen hospital is located is seriously big. This became apparent when I tried to leave. I need to mention here that my friend’s internal GPS system leaves a lot to be desired. He helpfully took my handbag and went to get the car from the public car park opposite the hospital. I was wheeled to the hospital’s underground car park by a member of staff whose job it is to move patients in wheelchairs around the hospital. I don’t usually use a wheelchair, I rely on my friend’s arm and a stick, but now I find it difficult to get around with only one working arm. There was some confusion about a urine sample, which has still not been resolved or taken. This was due, I think, to mistranslation. I realised that my friend wasn’t going to come to the underground carpark and eventually, after waiting at least 20 minutes, finally persuaded my captors the wheelchair operatives to take me back to the last place I had seen him – the reception desk of the mother and children’s ward where the tests had been carried out. My friend had my money, phone and house keys, so when the helpful wheelchair guys suggested I took a taxi, I explained my predicament. One asked if I knew my friend’s phone number, but I didn’t. Then he asked if I knew my phone number. I did, and he rang it twice, but there was no answer. I felt that I was condemned to Hades. Or a cold version of it, as it was the end of November and a chill – or ill -wind was blowing. I finally convinced my escorts to phone the reception area from whence we had come, and she gave instruction for us to wait inside the main entrance. A friendly nurse asked what car my friend was driving, and what colour it was. I couldn’t help with the registration number. Finally, she saw my friend going very slowly past the door, and she rushed out and flagged him down. I thought he could wheel me down the ramp to the car, but no. Health and safety regulations didn’t allow this. I had to wait for a wheelchair attendant. I had spent most of the afternoon doing this. Finally, I was safely ensconced in the car, and very glad to be going home. We found the whole episode highly amusing. My friend had been parked outside the wrong hospital building for about 20 minutes. All the buildings look the same. Then he had gone up to the reception area where we had parted. The receptionist told him I had gone home. This must have been about the same time as the wheelchair attendants told me that he had gone home. Of course, I knew that the last thing he would do was leave me stranded. I must say, though, that I was very relieved when we found each other. I’m still waiting to be told when I will have my operation.